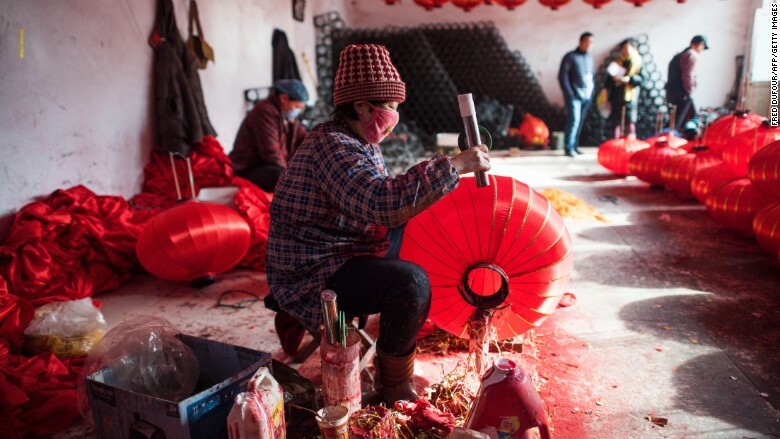 Factory workers in the village of Tuntou, in Hebei province, make lanterns for the upcoming Lunar New year holiday. China's crucial factory sector is sputtering. Manufacturing activity slumped again in January amid fears over the health of the economy. The official purchasing managers' index hit 49.4 in January, according to the National Bureau of Statistics, down from 49.7 the previous month. Any number below 50 represents a deceleration in the manufacturing sector. A separate survey conducted by Chinese media group Caixin showed manufacturing PMI at 48.4 in January, a slight improvement from 48.2 in December. The index has now been below 50 for 11 consecutive months. The official government manufacturing gauge is heavily weighted toward large enterprises, while the private Caixin survey taps a smaller sample size and places greater emphasis on smaller firms. Monday's poor data underscores growing concerns over the world's second-largest economy. Beijing reported last month that annual economic growth slid to 6.9%, the slowest pace in 25 years. Looking ahead, economists surveyed by CNNMoney are expecting even more sluggish growth of 6.5% this year. Stilll, some experts are taking a cautious approach to the latest manufacturing numbers, which they say don't paint a full picture. "The PMIs provide an early hint of how the economy is performing, but we don't recommend putting too much weight on them," said Julian Evans-Pritchard of Capital Economics. "The official manufacturing PMI, in particular, appears to have been a poor gauge of economic activity over the past year." Plus, economic data coming out of China typically reflects seasonal fluctuations around this time of year. The Lunar New Year holiday next week is the biggest annual holiday season in the country, a time when workers return home and businesses shut down for a break. And despite some minor government stimulus efforts last year, there may be a bit of a delay before the impact shows up in the numbers, Evans-Pritchard wrote in a research note. China has recognized that slower growth is on the horizon and has been pursuing reforms to allow market forces to play a greater role. In particular, the government wants growth to come through greater consumption, rather than exporting goods and investing heavily in things like railways and bridges. It's also trying to shift emphasis to the services sector and away from factory floors. Stocks in Shanghai were down around 1% in Monday morning trading.